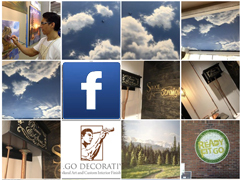 Denver, CO-based G.Go Decorative are now offering the local industry’s leading design and painting services for children’s murals. The company is inviting parents and future parents across the region to review their services, which can be utilized to inspire a child’s creative side with the painting of a landscape scene or a child’s favorite movie scene. Each mural helps form that perfect nurturing environment to ensure the child feels comfortable and safe in their home surroundings. For those about to have their first child, the process of creating that ideal nurturing nursery environment can be exciting and challenging. A room’s décor can provide the foundation to many happy memories being created in the future. And so parents and future parents alike are now considering professional decorating options that will help children feel comfortable and inspired. The services of Denver-based specialists such as Gary Gomez and his company, G.Go Decorative, are the requisite solution to this decorating challenge. G.Go Decorative offers unparalleled creativity for standout murals that will transform a living space. A leading reason so many parents now work with Gary Gomez and his team is that he’s achieved a standout collection of pieces to his name. Parents can speak with Gary Gomez directly to find out how affordable it is to achieve their own dream nursery environment. Whether clients have their own idea for the space or require additional expert help in the creative process, the experts at G.Go Decorative offer expert decorating services that will ensure a comfortable and imaginative environment for all children. To learn more about G.Go Decorative and the company’s services, please contact their offices directly or visit their business website today at www.ggodecorative.com.